Many Pennsylvania ARD applications contain a question that requires applicants to report prior charges even if those charges have been expunged or sealed. Obviously, if an applicant reports prior offenses or prior charges, such information will be considered by the district attorney when reviewing the ARD Application and are likely to reduce the probability of being approve for ARD. An ARD applicant clearly does not want to over report priors. However, if an applicant fails to report information, the omission is likely to result in denial of ARD and may even result in additional criminal charges. Many ARD Applications require the person to sign and legally verify that all the information contained in the Application is true and correct to the best of the person’s knowledge. Providing false information can actually result in a criminal charge of Unsworn Falsification to Law Enforcement under 18 Pa.C.S.A. 4904. 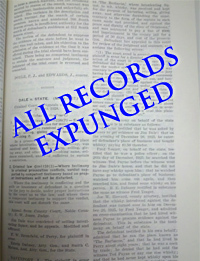 Whether or not expunged or sealed records need to be included on an ARD Application depends upon the precise language used in the state’s law that allowed for the records to be sealed or expunged. For example, in the case Commonwealth v. Fleming, 955 A.2d 450 (Pa. Super. 2008), the defendant had a prior felony drug conviction from the state of Maryland, and he was applying for ARD in York County for his pending driving under the influence offenses. In that case, the Pennsylvania Superior Court reviewed the Maryland expungement law and found that Maryland’s law prohibited states from considering an expunged conviction for almost any reason. Because the court found that the Maryland expungement law prohibited the prior offense from being considered, the court ruled that the York County District Attorney had improperly denied ARD in the man’s case. to summarize, the court ruled that the man not been required to report the prior offense on his ARD Application, and the prosecutor’s consideration of the prior was improper. However, in Commonwealth v. Jagodzinski, 739 A.2d 173 (Pa. Super. 1999), the Superior Court reached the opposite conclusion after reviewing an Ohio expungement law. In that case, the Ohio law provided that the expunged record could be considered by future prosecutors or the court when reviewing requests for pretrial diversionary programs, which would include an ARD evaluation and consideration. In Jagodzinski, because Ohio’s expungement law clearly allowed for consideration in situations like ARD requests, the Superior Court ruled that the prior conviction must be reported and could be considered by the district attorney as part of the ARD consideration process. In Pennsylvania, prior DUI offenses must be included on ARD applications even if they have been expunged. In the case of Commonwealth v. Belville, 711 A.2d 510 (Pa. Super. 1998), an ARD applicant submitted an ARD application without noting her prior ARD for a DUI case because it had been expunged under the Pennsylvania expungement law found at 18 Pa.C.S.A. § 9122. That expungement law expressly notes that prosecutors are permitted to retain records for future consideration into pretrial diversionary programs such as ARD, so the court ruled that the prior ARD case should have been reported and considered by the district attorney. However, in Commonwealth v. Benn, 675 A.2d 261 (Pa. 1996), the Pennsylvania Supreme Court ruled that a prior drug case that had been expunged to a Pennsylvania expungement law in the drug code, 35 P.S. § 780-119, need not be disclosed on an ARD application. What the cases above show is that there is no general answer to the question about whether or not an expunged charge must be reported on an ARD Application. Whether or not to report requires a precise review of the expungement law from the state that expunged the records. Every state has different expungement laws, and each state may even have different expungement laws for different types of cases, so every case must be analyzed on a case-by-case basis. The best way to proceed is to retain an experienced criminal defense attorney for guidance. At JD Law, we offer a free initial consultation. To have your case reviewed by our defense lawyers, contact us at 814-954-7622 or via email.